The rain has finally been coming down. While it is a relief to see the rain here in California, that doesn’t mean the end to the drought. We may be at about 50% of the levels needed. If you normally grow tomatoes in your backyard, and live in an area that might be facing a drought or water rationing of any sort, the possibility of less water might make you reconsider growing them this year. But, there is a way to grow tomatoes with less water. Its called dry farming. You may have heard of it; there are some commercial organic farms that dry farm here in California and elsewhere. But it can also be done in the home garden. I have not tried this method before, but I am going to experiment this year. With dry farming, you are trying to stress the plant to the point where it adapts to do more with less. I’ve been told by those that have done this, that the tomatoes are smaller but much more flavorful. If you are curious about this method, I’ve attached a publication by the Contra Costa Master Gardeners explaining how its done. You don’t need to live in California to do this. 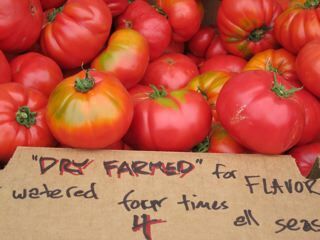 Click here to view dry farming tomatoes. Just one note on the CCMG publication: If you have a raised bed that already has some good soil in it, then you don’t need to double dig quite so extensively. The objective is to make sure you have nice, fluffy soil that allows the tomato plant roots to grow deep down into the soil to find the moisture below.